Sony has announced its latest range of style headphones, with the MDR-570, MDR-370 and MDR-EX77LP and MDR-EX57. The 'murder' range – as we've decided to call them due to their unfortunate letter selection – is all about the looks. 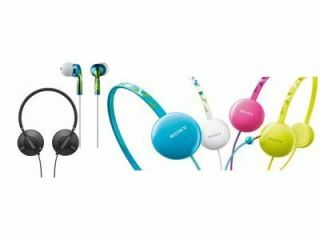 "Add a splash of colour to your favourite music with this season's new collection of great value headphones from Sony," says the company. The closed back 'colourful' 570 range offers a 30mm Neodymium driver and a gold-plated stereo plug and is a 'perfect upgrade for your MP3 players supplied headphones'. The 370 range has a headband that is, and we quote, 'designed to fit youthful teenage music fans' and is available in four 'cute' colours: pink, blue, green and white. Finally, for 'when style is as important as premium sound' come the MDR-EX77LP and MDR-EX57 ranges. That means a 9mm neodymium driver, carry case and cord adjuster. The new MDR-570, MDR-370, MDR-EX77 and MDR-EX57 headphones by Sony have a UK release date of April 2010.